With its high-calorie, meat-based recipe, Bully Max High Performance is one of the go-to dog foods for pitbull owners and our pick for the best option overall. Every cup contains 535 calories, giving your dog plenty of fuel to keep them active and energized. It’s free of artificial flavors and preservatives, and along with ingredients like corn, wheat, and soy, the recipe emphasizes meat and has a 30 percent protein/20 percent fat formulation. It also consists of 3.8 percent fiber and 10 percent moisture, according to its guaranteed analysis. Customers write that Bully Max High Performance Super Premium Dog Food is perfect for athletic dogs of all types, but it’s especially well suited to pitbulls. Whether your dog is still growing or could stand to bulk up a bit (some buyers use it to support healthy weight gain), its high-calorie, grain-free recipe is designed to help them thrive. Some of the high-end dog foods on the market can take a serious bite out of your wallet, but don’t worry: There are plenty of lower-cost options that still prioritize the nutrients your pitbull needs to stay healthy. Purina ONE SmartBlend costs just over $30 for a 27.5-pound bag, but its 30 percent protein recipe provides the muscle support you’ll want when selecting dog food for your pit. The first ingredient is turkey—the real kind, as the food is free of poultry by-products—and its formulation does away with artificial flavors and preservatives. Meanwhile, glucosamine found naturally in turkey meat provides joint support for your pitbull’s active lifestyle. Beyond its 30 percent protein formulation, Purina ONE SmartBlend consists of 17 percent fat, 3 percent fiber, and 12 percent moisture. Customers write that it has helped their pitbulls grow thanks to the amount of protein present, and has also solved problems like gas and upset stomach. While this food does contain grain, it still prioritizes meat as its main ingredient. Adult pitbulls tend to thrive on a high-calorie diet, and the same goes for pitbull puppies, who need the same nutrients to keep them healthy as they grow. Taste of the Wild’s High Prairie Puppy Formula is a grain-free food that features real buffalo as its first ingredient, and also includes great sources of protein like bison, venison, and beef. Meanwhile, fruits, vegetables, and dried chicory root aid with digestion and support gut health, while omega-3 and omega-6 fatty acids keep your puppy’s coat lustrous and skin itch-free. It consists of 28 percent protein, 17 percent fat, 5 percent fiber, and 10 percent moisture. Customers love Taste of the Wild’s High Prairie Puppy Formula because it’s full of healthy ingredients and can assist with healthy weight gain for pitbull puppies as they grow. The small size makes it easy for puppies to consume—which they tend to do so happily with its savory taste. With between 85 percent and 90 percent meat ingredients, Origen Original Dry Dog Food is designed to support your pitbull’s high-energy needs and then some. This grain-free food contains both poultry and fish (but no by-products), with plenty of quality proteins, fats, and minerals—it’s even rated for human consumption due to the overall quality of its ingredients. It consists of 38 percent protein, 18 percent fat, 4 percent fiber, and 12 percent moisture, and its mix of healthy carbohydrates is just right for maintaining a pitbull’s muscular build in their prime adult years. Customers rave about Orijen Original Dry Dog Food’s wholesome ingredients and grain-free formulation, saying it’s one of the best-quality foods they’ve tried. While the high quantity of meat in each bag (more than most dog foods) commands a higher price, some buyers note that it really is the next best thing to giving your dog a fully raw diet. For a senior pitbull, you’ll want a food that pairs a high protein recipe with the benefits of glucosamine and chondroitin for added joint support. AvoDerm Natural Health Solutions includes both, plus docosahexaenoic acid, or DHA—an omega-3 fatty acid that’s good for the eyes and brain. The food is grain-free, making it easy for seniors to digest, and includes avocados in the recipe for additional antioxidants and vitamins. However, the food still prioritizes meat, with lamb and chicken among the first ingredients. With 28 percent protein, 10 percent fat, 6 percent fiber, and 10 percent moisture, it’s a great food for senior pits that helps them maintain their weight and keeps their joints healthy as they age. Customers call AvoDerm Natural Health Solutions “the best dog food on the planet,” writing that the inclusion of glucosamine and chondroitin keeps their dogs active and playful in their older years. Meanwhile, the avocado oil in the recipe helps to maintain a soft coat, and the lack of grain keeps skin comfortable and itch-free. Want to take a look at some other options? See our guide to the best natural dog foods. While there are plenty of grain-free foods providing relief for dogs with skin sensitivities, we’re especially big fans of Natural Ultramix. In addition to being grain-free (its first ingredient is duck), this food is full of omega-6 and omega-3 fatty acids to support healthy skin and a soft coat. Sweet potatoes provide antioxidants, and additional probiotics support healthy digestion. It’s also as high-protein as you’d want a food for pitbulls to be, with its guaranteed analysis including 38 percent protein, 17 percent fat, 3.5 percent fiber, and 11 percent moisture. In addition to duck, it also includes chicken, lamb, and salmon, so it’s full of the nutrients your pit needs to thrive (while keeping their skin comfortable). Natural Ultramix Grain-Free Dry Dog Food is perfect for helping clear up itchy skin, customers write, thanks both to its lack of grain ingredients and helpful dose of fatty acids. Since pitbulls can be prone to skin issues that are less common in other breeds, foods like this one can be a powerful tool to stop excessive scratching and other unhealthy habits—while giving your dog a high-protein diet they'll love. Got a pitbull with food sensitivities? Consider a limited-ingredient diet. 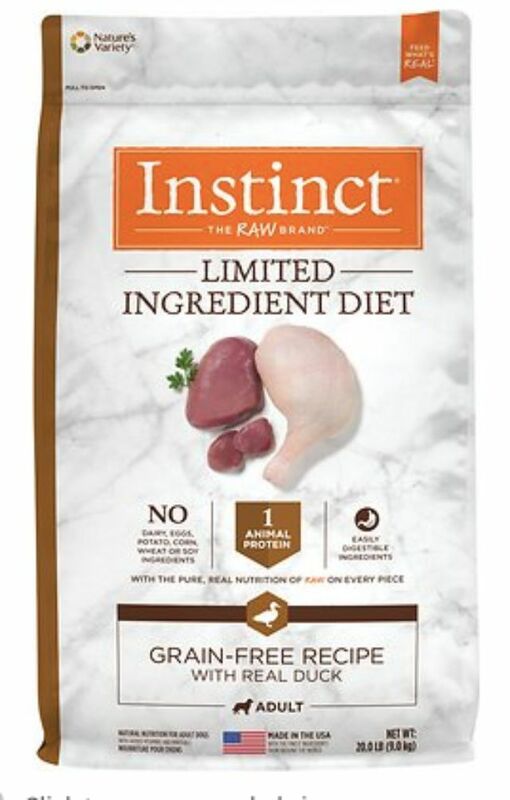 Instinct by Nature’s Variety includes a single protein source (in this case, duck) and one vegetable for a food that’s easy to digest but still rich in nutrients. The restricted ingredient list makes it far easier to control your dog’s intake, cutting out extras (like grain, dairy, and eggs) that can potentially result in digestion issues. However, it’s rich in antioxidants and omegas—and with cage-free duck that’s freeze-dried raw, there’s plenty of protein to keep your pitbull energized. It consists of 27 percent protein, 17 percent fat, 3 percent fiber, and 10 percent moisture. Customers write that Instinct by Nature’s Variety has worked wonders for their food-sensitive dogs, solving issues like hot spots and chronic upset stomachs (the proof, several note, is in the poop). The lack of additives sets it apart from other dog foods, even ones purporting to offer a more natural diet. Check out our other reviews of the best dog foods for sensitive stomachs. While most pitbull owners won’t feed their dog an exclusively wet food diet, it can be an effective way to get some additional moisture into your dog’s diet—a plus if they don’t drink enough water or tend to get dehydrated quickly. This wet food from Blue Freedom is grain-free and features chicken as its first ingredient. Plus, it's full of fruits and vegetables for additional nutrients and antioxidants. Potatoes and oatmeal in the recipe also contribute some easily digestible carbohydrates. Consisting of 8 percent protein, 6 percent fat, 1.5 percent fiber, and 78 percent moisture, we’d recommend using it as a food topper or treat alongside a traditional dry food. According to customers, Blue Freedom Grain-Free Wet Dog Food is great for highly active dogs and the taste is great. Plus, the high-quality protein and grain-free recipe is a hit even with picky dogs who hesitate during mealtimes. It will go down easy and provide them with much-needed nutrients. Our writers spent 3 hours researching the most popular dog foods for PItbulls on the market. Before making their final recommendations, they considered 50 different dog foods for Pitbulls overall, screened options from 30 different brands and manufacturers, read 100 user reviews (both positive and negative), and tested 0 of the dog foods themselves. All of this research adds up to recommendations you can trust.